Well, guys, I don’t claim to be an end-all to your pop culture tastes and preferences. And, to show that, I wanted to offer up a (very) well-penned perspective on the movie that hit theaters last Friday. Here’s to healthy debates and a myriad, melting pot of opinions that exist (among friends) in the world today… And specifically, today’s opinion, courtesy of Mr. Brian Schlageter. (…Also, it’s worth props for the patience it takes to send a message like this out over Facebook, in that cramped, anti-wordsmith style template they offer). I read a lot of your movie reviews, and having seen Transcendence this weekend I can’t help but think you might have tilted your focus on this one. Boring is about the last word I would use to describe Transcendence. As someone who spends a lot of time reading up on, and following, current science and medical news I found the ideas presented in this film thought-provoking. The idea that after the singularity of artificial intelligence we could experience a technology renaissance like we’ve never seen before is something to which I personally look forward. I think the most interesting dog-leg (not really a twist) of the movie was the ambiguous protagonist and antagonist role. Characters seemed to slide from one side of the fence to the other. Rather, the fence itself was sliding. Initially the RIFT group was looked at as terrorist for blowing up cyber cafes and research labs. This act shoved the ‘good-guy’ image of Depp and his friends into our faces. Jack Sparrow has yet again made us love the abominations of the world. 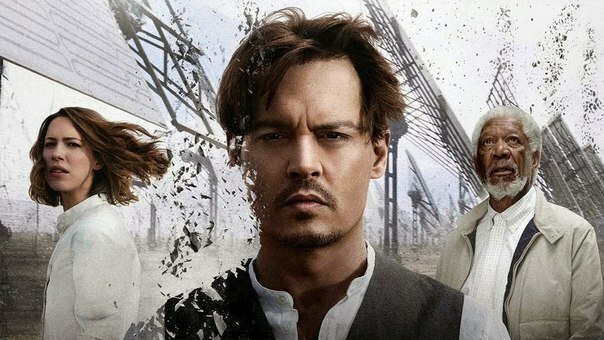 However, once Depp’s character transcends and becomes an integrated part of every networked computer (an idea that is quite loosely based in realistic capabilities) he is then pictured as a bad guy, and the RIFT characters now wave the flag of the right and just, who are trying to dethrone an omniscient king. Finally, when both Depp and his lady (SPOILER ALERT) lay dying on the bed, he is able to show her that he was not only healing humans at a rate we will likely never see in our lifetimes, but also healing the planet in a manner which has never been done in the history of mankind. At the end of this movie I was left absolutely hating the RIFT characters and their stubbornness to allow technological evolution to take its course. But hey, at least they gave the guy from Legion a sweet tan! I understand that seeing this movie without first contemplating the ideas, possibilities, and ramifications of a singularity moment such as this would make it seem “far-fetched”, but the reality of it is, we are closer to this singularity now than I think a lot of people realize (20-30 years, generously). I suppose this might come off as a rebuttal to your blog; which I don’t intend for it to be, I just think the thought-provoking aspect is there as long as the curiosity of future tech is also present. Thank you, Mr. Schlageter! And to my own readers, his opinion was welcome, pondered, considered and, yes, even partially adopted–ramifications of my quick-to-dismiss personality traits. Sigh. Look forward to hearing what the rest of you think, when (and if) you see this flick. « Movie Monday | Transcending Talent… all of it.